The use of poetry in this day and age is for its lesson of relation. 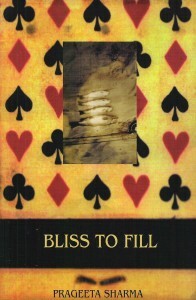 Bliss to Fill is full of love poems, full of I and you and all their difficulties in getting along. And here, in the midst of love’s intimacies, the poem is large and necessary, negotiating places and cultures, negotiating what it means to be relating across boundaries. This is a stunning collection. While others were writing software Prageeta Sharma was writing “Dear ____ or Bliss to Fill”, a rhapsodic collection in which the poet uncannily braids the young and anticipatory with the elderly and elegantly alone. Her medium: loyalty; her climate: tender. She pleasures us by her agile shifts in mood and her lithe twists of tongue. This is a delicately fierce book. The first-generation child of a South Asian immigrant family and a native of Framingham, Massachusetts, Prageeta Sharma is the author of Bliss to Fill (Subpress, 2000), The Opening Question (Fence Books, 2004; selected by Peter Gizzi for the 2004 Fence Modern Poets Prize), Infamous Landscapes (Fence Books, 2007), and Undergloom (Fence Books, 2013). She is also the recipient of the 2010 Howard Foundation Grant. Sharma is associate professor and director of the creative writing program at the University of Montana.